Thoughtfully designed for the safety and comfort of both small and large pets. DIMENSIONS: 18 inches long X 12 inches wide X 12 inches high. PLEASE MEASURE YOUR PET’S HEIGHT FOR FIT TO AVOID RETURNS. AIRLINE APPROVED: Designed as airplane carry-on. Check airline to confirm size requirements. DOUBLE EXPANDING SIDES: Fully expandable side compartments for more room in airport, car or airplane. VENTILATED BREATHABLE MESH: Breathable strong mesh construction for excellent ventilation and visibility. DURABLE CONSTRUCTION: Made from 600D Oxford Cloth and #1 600 PVC. The hoops for the end openings and expanding sides are 100% steel, not plastic, to hold up properly and not sag on your pet like inferior products. The zippers and attachments are top quality. INCLUDED COMFORT PAD: There is a removable, hand-washable, comfortable pad in the main compartment that is sure to keep your pet feeling relaxed and comfy. BONUS FEATURES: Other features: Foldable to less than 2 inches flat, adjustable padded shoulder strap, velcro fastening handles, luggage handle strap, inside safety leash, outside Velcro fastened pocket, rubber feet, and of course the expanding sides. 100% SATISFACTION: One year from purchase date. 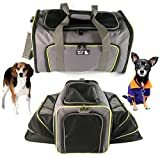 Buy from the trusted experts in pet travel.